Oh, these days... the FUN! Making home ready for Advent and Christmas! We've begun decorating here at home-- adding purple cloths here and there. 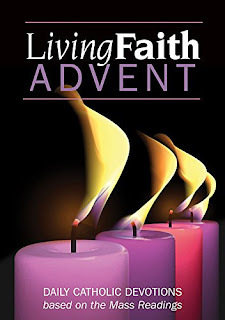 Purple being the liturgical color for Advent. I love living church at home, which we are called to do. I love the rituals. 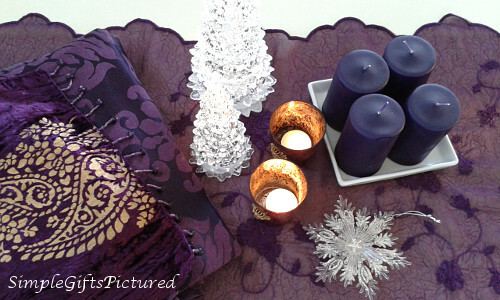 Purple candles are ready to light each week of Advent. (Often a pink candle is used for the third Sunday in Advent, Gaudete Sunday, which is symbolic of joy... but for simplicity's sake I have purple candles for this year.) There will be extra candles lit, and a few sparkly decorations... We things simple, but meaningful, decorating in the colors, purple, white, gold and silver. 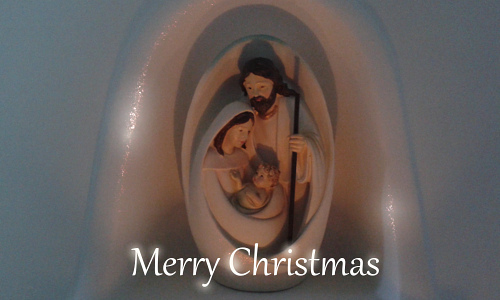 We have an extra candle for Advent this year, a pretty one with numbers. We love candle glow this time of year, so couldn't resist! A new set of cookie tins came home with us recently. 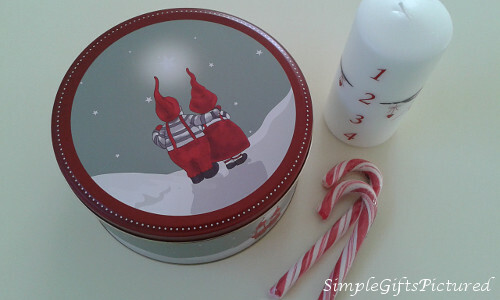 A set of three--two smaller tins nest inside this larger one with cute Christmas gnome-motif. Since we will be home here for Christmas, I plan on some baking and treats! This is Luna's first Christmas with us, and we are excited! I crocheted a Christmas stocking for her that will be hung up. It is larger than it looks in the photo--about 16-inches long/ 40cm. Big enough for Luna to fit into... haha! It was very fun to make. I used this pattern, which is great for yarn stash-busting. 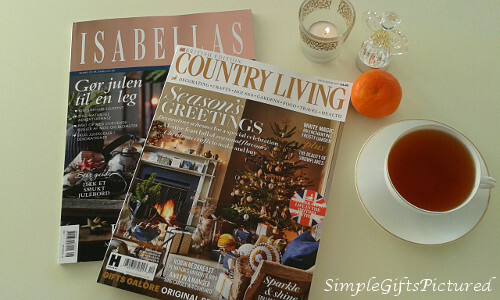 A treat at the moment...year-end issues of Country Living magazine (the UK edition) and Isabellas--a stylish quarterly Danish magazine. Danish is very similar in a lot of ways to Norwegian, so I'm enjoying the challenge of reading this Danish magazine. 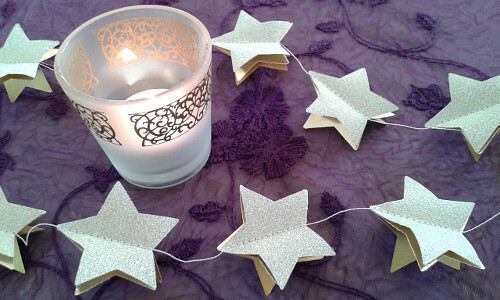 We have a pair of lovely garlands of sparkly gold glitter paper stars to hang up... These were purchased from LaMiaCasa shop via Etsy. 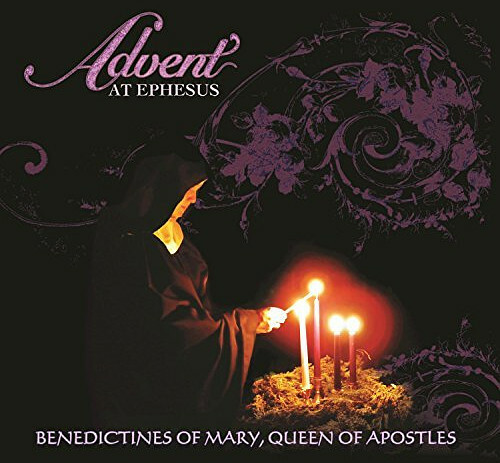 ...as well as this GORGEOUS recording, Advent at Ephesus sung by the Benedictines of Mary, Queen of the Apostles! Thank you for sharing with us such interesting ideas for Advent. There is such beauty and peace in enjoying the simple things. I loved your post yesterday too and am still wading through all the places and ideas you posted in! What a gold mine of info! Thanks so much! Your tree is so lovely! 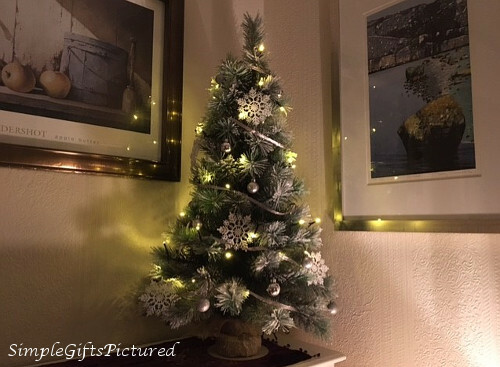 I love snowflakes on a Christmas tree and on mine, I will leave it up after the other things are down just for the light. Luna's sock is just adorable! I bet it will be stuffed with treats and toys for her. And don't worry too much about the tree. In re-using it, you are not adding to the plastic but being cautious with your resources and also saving a tree (unless you would be planting it after). Besides. It looks wonderful. so lovely! I love ritual too and am excited to be decorating for Christmas! Enjoy what you have and be thankful, right?! :) God bless you!!!! a HUG to you! your little tree is beautiful! don't sigh. you should smile. because it's just one other wonderful tree that keeps a living one from being cut down. I live in a state where the summers are unbearably HOT. and yet where trees are expendable for some reason. as if they grow like weeds. which they do NOT! we need their oxygen-giving life! nothing to me is sadder than seeing trees after the holiday thrown to the curb. to me they are as important to our lives as not using plastic!!! the city picks up the dead Christmas trees and some of them are mulched. still... it makes me sad! I think the tree would probably rather still be a living thing! I very much enjoyed reading of your season preparations for Advent. I enjoyed reading the links; love learning about your faith. I love the simplicity of it all. 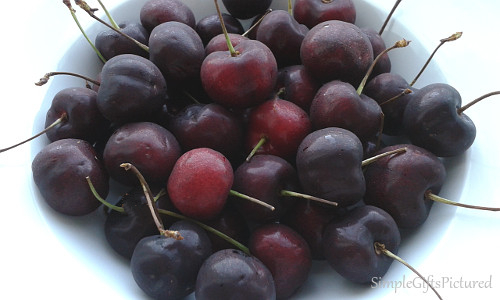 Your photos of your candles, tins and your darling tree are lovely. 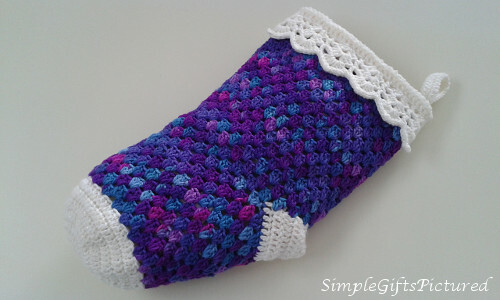 I especially loved the crocheted stocking for your adorable Luna. I like to read the Country Living Magazine but haven't for a long time. 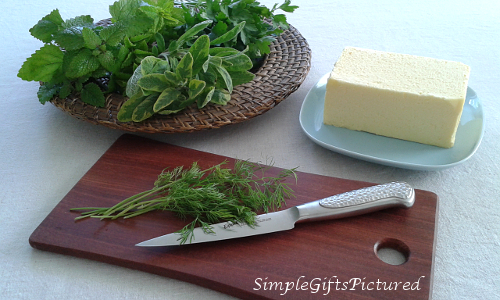 I love country decor, cooking and etc. I really love Christmas music. 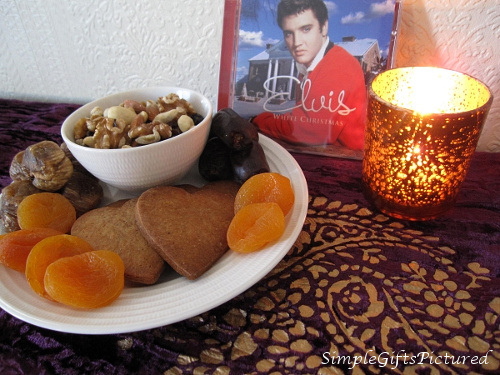 Elvis's White Christmas is a favorite. There is a radio station here that plays non stop Christmas music; so fun. Have a sweet weekend by dear friend. Sending extra love and hugs your way! I love that you are thoughtfully celebrating Advent with the touches to help you focus and enjoy with all your senses. Looking forward to following some of your musical links!